By William W. Savage, Jr.
"[Savage] is due our regard both for his efforts in assembling this diverse material in one place and for his lack of musical prejudice. 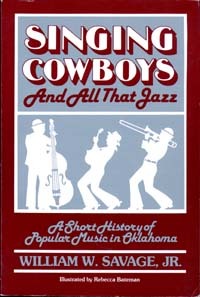 The book moves easily and naturally from discussion of early jazz to Gene Autry and country musicians, Woody Guthrie, rock & roll, and in the final chapter to contemporary Oklahoma musicians like Alan Munde . . . . The text is so engaging, the organization so good, that one continually wants more. Texas Ragg. s "Savage, an academic historian, has surveyed popular music in Oklahoma and by Oklahomans in the last few decades in brief and very readable fashion." Choice. "An excellent survey of popular music in the Sooner State .... Savage provides more than mere details, however, as he places the development of Oklahoma's popular music in an appropriate historical context. Thus the Depression of the 1930s made Woody Guthrie's `message' folk music respectable. Bob Wills's blend of black and blues elements, in his 1940s western swing, surely helped pave the way for rock `n' roll in the 1950s. And artists as diverse as Gene Autry, Jimmie Wakely, Patti Page, Kay Starr, Roger Miller, Hoyt Axton, and, yes, Moon Dog, have drawn on their Oklahoma heritage in their music .... [It is] a very entertaining, informative work." Southwest Review. "The book is well written and highly readable. There are eleven chapters, notes, and an index. Pen-and-ink drawings by Rebecca Bateman are sprinkled throughout the work." Kansas History. William W. Savage, Jr., received the B.A. and M.A. degrees from the University of South Carolina, and the Ph.D. in history from the University of Oklahoma, where he is now Associate Professor of History. He is the author of The Cherokee Strip Live Stock Association (Columbia, Missouri, 1973). He is also the author of The Cowboy Hero: His Image in American History and Culture; the editor of Cowboy Life: Reconstructing an American Myth, and of Indian Life: Transforming an American Myth; and coeditor of The Character and Influence of the Indian Trade in Wisconsin, by Frederick Jackson Turner, and of The Frontier: Comparative Studies, Volume 2, all published by the University of Oklahoma Press.